64-in / 64-out audio interface with eight digitally-controlled, 'Air' enabled, Red Evolution mic preamps and dual Thunderboltâ„¢ 2, Pro Tools|HD and Danteâ„¢ network audio connectivity. The latest incarnation of Focusrite's best audio interface yet, the 64-in/64-out Red 8Pre combines eight digitally-controlled, 'Air' enabled, 'Red Evolution' mic preamps, 16 analogue inputs and 18 analogue outputs and advanced 24-bit, 192kHz conversion with dual Thunderbolt 2, Pro Tools|HD and Dante network audio connectivity. Featuring a beautiful yet robust design, the Red 8Pre represents the perfect balance of form and function, delivering the sound quality, transparency and versatility that audio professionals expect from Focusrite. The Red 8Pre Thunderbolt, Pro Tools HD and Dante Audio interface is the latest iteration of Focusrite’s most advanced audio interface yet. With 64 inputs and 64 outputs, it delivers eight redesigned ‘Red Evolution’ mic preamps deployed direct from the front panel, as well as premium digital conversion and millisecond-level low round-trip latency. So low, in fact, that DAW plugins can be implemented while the user monitors recordings, for instance to add reverb in the headphones for a vocalist. The fresh Red mic pre includes the switchable “Air” effect that reproduces the sound of Focusrite’s notorious ISA transformer-based preamps, as well as providing very low noise (EIN -128) and distortion. The Red 8Pre additionally supplies gain controls with a special law, making changes softer and more organic. Focusrite has been well-renowned for top-quality digital conversion for almost as long as it has been revered for its microphone preamps, and The Red 8Pre isn’t an exception. Featuring the latest in Focusrite precision digital conversion, 8Pre’s 192kHz/24-bit converters dispense up to 118dB (A/D from mic pre) / 119dB (D/A line out) real world dynamic range. The Red 8Pre utilises a grand total of 64 inputs and 64 outputs (including 16 analogue inputs and 18 analogue outputs), incorporates dual Thunderbolt 2 ports for round-trip latency as low as 1.67ms, and direct connection to Pro Tools | HD systems. Add to that the ability to connect up to 32 additional inputs and outputs via Dante Ethernet-based audio networking and you have one of the most advanced, best-sounding, and most versatile interfaces available today. The pinnacle of interface design – The Red Range is Focusrite's best interface series yet. Their cleanest mic preamps, best-sounding converters and a build quality that harks back to the original Red series. Focusrite's best conversion performance – Delivering precision-calibrated digital conversion at up to 24-bit/192kHz, with up to 121dB dynamic range, Red 8Pre's converters feature a 'parallel path summing' configuration to realise their quietest design to date, with an optimal combination of sound quality, noise floor, dynamic range and conversion latency. Exceptional performance makes Red 8Pre perfect for high-resolution audio. Eight Red Evolution Air-enabled mic pres – Provide up to 63dB of ultra-clean gain and offer individual phantom power, setting recall, stereo linking, HPF and polarity invert, plus Air mode, which provides an analogue emulation of our heritage ISA preamp characteristics. Clean, clear and elegant front panel – Colour LCD displays and assignable control knobs make the Red 8Pre simple and quick to use. Set levels and other parameters from the front panel as well as via software. Dual Thunderbolt 2 ports for daisy-chaining – With two Thunderbolt 2 ports, you can connect to the DAW of your choice whilst simultaneously connecting Thunderbolt devices such as hard drives and displays. 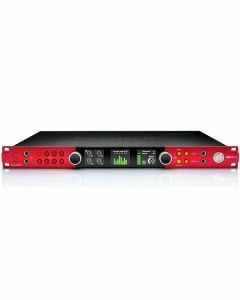 Direct Pro Tools connection – In addition to Thunderbolt, the Red 8Pre offers standard dual DigiLink connectivity to Pro Tools | HD systems and existing Avid interfaces. Dante Network Audio enabled – the Red 8Pre includes dual Ethernet ports for Dante audio-over-IP networking, allowing you to expand your studio via Ethernet with additional channels anywhere on your network, with low latency and lower cost. Add channels by connecting additional Red or other Dante-compatible components to the Ethernet ports. 1.67ms round-trip latency – Track with your preferred plug-ins and record virtual instruments in real time. Simplify your workflow: run a single mix on your DAW for both overdubbing and mixing, with your plug-ins in place, all the time. No need for cue mix utilities or outboard DSP. Expansion done right - add up to 32 extra inputs and outputs to the Red 8Pre - wherever there's an Ethernet connection. Dante lets you run additional channels over a greater distance, with lower latency and at lower cost, without wasting money on unused hardware. 64 inputs/64 outputs – including 16 analogue inputs and 18 analogue outputs. Remote control from iPhone or iPad - Download the free Focusrite iOS Control app and adjust cue mixes created with the Focusrite Control desktop app and preamp settings remotely from an iPad, iPhone or iPod touch. Software Included – Every Red 8Pre includes Focusrite Control software, allowing mic preamp control and the quick and intuitive set-up of mixes and monitors; the Red plug-in suite, which accurately models Focusrite's classic Red 2 and 3 EQ and compression; and Softube's Time and Tone bundle – a unique plug-in pack including four of Softube’s professional quality plug-ins: Drawmer S73 Intelligent Master Processor, TSAR-1R Reverb, Tube Delay and Saturation Knob.